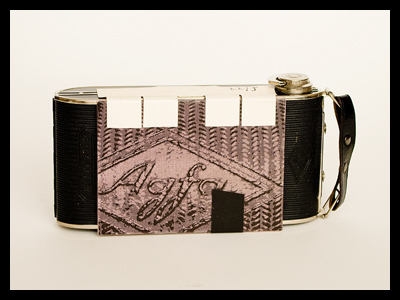 Agfa Clack is a camera that is easy to come by, at least in Sweden, at very reasonable prices. It is also an easy camera to convert to pinhole without any feelings of guilt, because it’s not a very beautiful or a good/bad enough camera to be any fun in its original state. Basically you just need to remove the lens, cut a few wires and mount the pinhole. 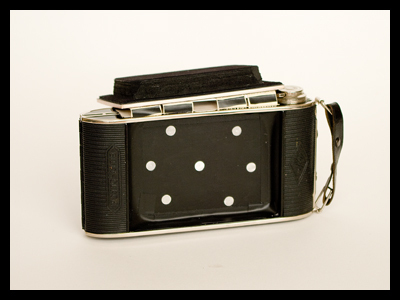 Thanks to its size the Clack Obscura is not a very wide angled camera which makes it suitable for portrait photography. On the other hand, a large camera means a big f-stop number, which in turn means that your models need to be very patient. A really good thing about the Clack is that you can keep the cable release socket, so that the camera will get a touch of high-tech. Which is clearly visible in the image above. f/240. Focal length=72 mm. Takes 120 film. Agfa Isolette is one of many 120 format rangefinder cameras from the 50s/60s that has the lens attached to a pop-out bellows. This means that the bellows can be removed! That done, you have a sturdy and reliable camera body to start building a very wide-angled pinhole camera from. The shutter on this one is made from plywood. In short, a tool that will not fail. f/110. Focal length=23 mm. Takes 120-film. When one of my Holga cameras kicked the bucket I turned it into what has become one of my favourites. 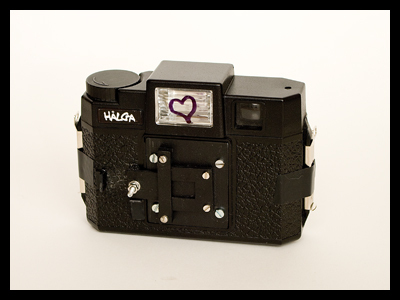 If you remove the lens from a Holga the focal length becomes fairly short, which is a thing I like. That means that the aperture value can be made quite large, which in turn means that you can use the camera without a tripod and still get decent results. On a sunny day the exposure is around one second on ISO 100 film. I built the shutter for this camera from a black plastic letter rack which was soft enough to be easily cut with a fretsaw. 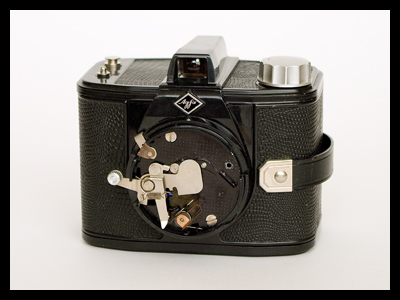 On the down side is the fact that the camera still has its Holga features intact, which means that the camera back might come off mid-roll. Rubberbands or tape around the camera prevents this kind of mishap. Unless you want to spice up your photo life a bit, in which case, of course, you will welcome all such accidents. f/116. Focal lenght=25 mm. Takes 120 film. 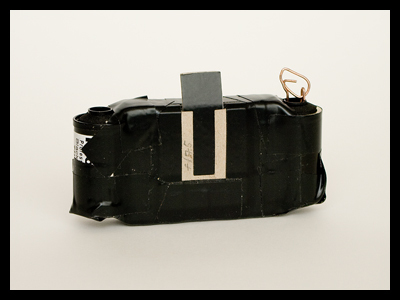 Beneath this generous amount of electrical tape hides an ordinary matchbox. It feeds on 135 size film and is very convenient. On sunny days ISO 100 film is enough to do sports photography with it. I have pimped my pinhole ride by adding a piece of thin metal that goes into the sprocket holes of the film, so that the film itself tells you loud and clear when you have advanced the film far enough. Very wide angled, so you need to keep close to your subject! f/75. Focal length=15 mm. Takes 35 mm film. 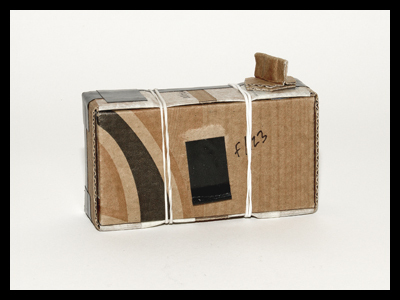 This camera is a cardboard cylinder, of the kind you would use for carrying around posters or drawings or sending them by mail. For the bottom part of the camera I fastened a tripod socket in epoxy, inside the plastic cap that comes with the cardboard tube. The cap itself is painted black and held in place by electrical tape. 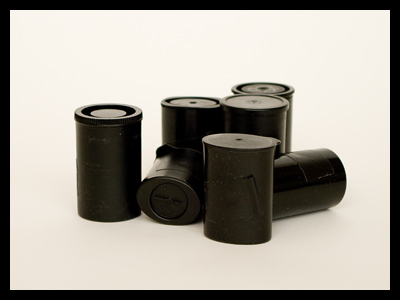 The shutter is made from black stiff paper that slides sideways to reveal the pinhole. It is supported by more cardboard so as not to drift off vertically. The lid is made from Plastic Padding, cast in a plaster mould made from the original plastic cap. Two keyrings are attached to the lid as a handle and the edge of the lid is taped with black tape to keep the light out. 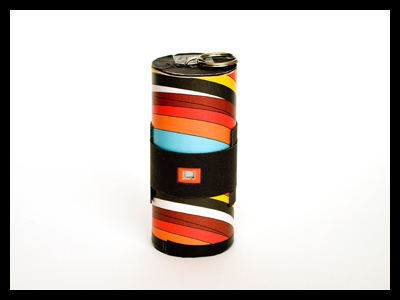 The photo paper or film is mounted along the curved inside of the cylinder, so that the camera gets a wide angle of view and the images are somewhat distorted when viewed flat. f/180. Focal length=70 mm. Takes 120×90 mm sheet film or photographic paper. This cookie jar cost me 0.50€ at a thrift shop, and I would not pay much more for a camera and still call it a bargain. In its new life as a camera it has been fitted with a tripod mount and is able to look in two directions. 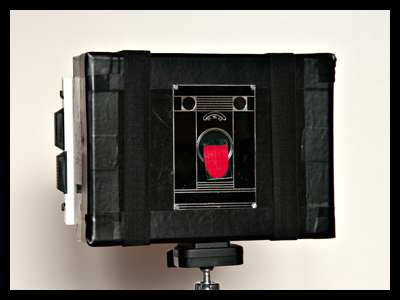 The photo paper is mounted vertically along the walls of the jar and if the pinhole on the front side of the camera is used, it takes the same kind of images as the cardboard cylinder above. But if you leave the paper in place and open up the top shutter it will instead take anamorphic images. The camera will then have a blind spot in front of it, and produces distorted, outstretched renderings of the peripheral surroundings of the camera. The “centre” of the image, as it were, will not be in the image. Very straight forward, in a way. f/240 and f/250. Focal length=100 mm. Takes 240×150 mm photographic paper. A Polaroid back is quite expensive and sometimes it's cheaper to buy a complete camera and remove everything that is not the back. That's what I did when I converted this Polaroid EE100. I added a wooden frame to the front of the camera to increase the focal length, because I didn't want the images to be too dark around the edges. The front pieces are made from MDF board, which is easy to work with and not very costly. The viewfinder does not give a representative view of what will be in the image, but I left it on the camera because it looked better with it than without. The camera has a tripod mount and is very stable. f/120. Takes Fuji FP100 film. These are among the simplest cameras you can make and the results can be wonderful. The pinholes are still made from metal, taped to the inside of a larger drilled hole in the canister itself. On a bright day you may want to minimise handshake effects by removing the tape in a dimly lit place (like a black bag) and use your finger as the shutter. But on a cloudy day the shutter speeds are up to 15-30 seconds and if you don’t use a tripod you are bound to add some extra shaking to the image making anyway so you might not find the need to minimise anything. These are the same canisters that I use to make solargraphs. f/40-f/60. Focal length=25 mm (APS-canister) and 30 mm (35 mm film canister). 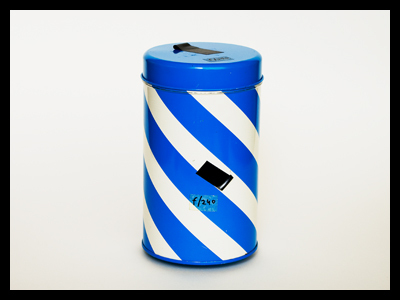 Takes photo paper (40×40 mm in the APS canisters and 60×40 mm in the 35 mm canister). They are very close to the film plane to interweave the images nicely, without getting so close to it that dark patches appear between them. The seven eyed Billy is a sturdy body with wide angle of view and a tripod socked, and it has been named Ettopeico by an Italian pinhole friend of mine. f/77. Focal length=22 mm. Takes 120 film. I saved what was left of the Agfa Billy Clack camera from the project above and used it as the front of the Billy Faceplate camera, made from a cardboard box that used to contain 20 rolls of Rollei Retro 100 film. 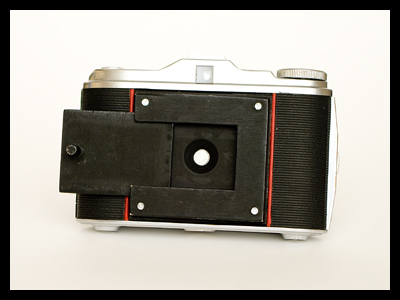 It is now a camera made for 4x5" film holders, that are held in place by rubber bands, equipped with a tripod mount and a simple black tape shutter. f/200. Focal length=65 mm. For 4×5" sheet film. This camera is basically just a tweaked version of the lovely little Czech paper pinhole camera Dirkon. 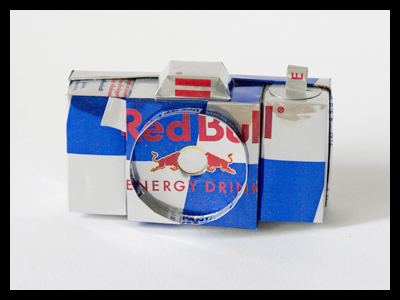 When I saw the invitation to the Red Bull Art of Can 2006 competition I saw that as my chance to build a camera entirely from soda cans. I tweaked the Dirkon model to create a more wide-angled version and excluded some of the extras from the original camera. And yes, I did try to get the bulls' heads on the shutter piece to fit with the ones on the front metal circle, but I didn't get it to work, so I had to choose between functionality and beauty. f/100. Focal length 25 mm. Takes 35 mm film. 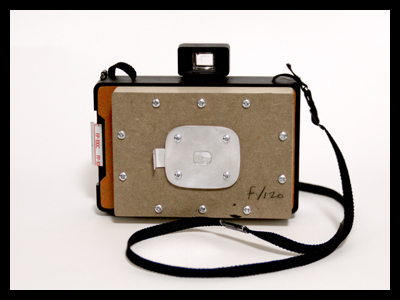 This camera is entirely made out of the leftovers of a junk meal; a pizza box and with the pinhole made in a piece of Coca Cola can metal. Even the film take up spool and winding knob is made from the same pizza box. But, without black electrical tape you'd be lost; I estimate that roughly 20 inches of it was needed to make the corners and the take-up spool light tight. And for making the shutter. This camera is lightweight, fast and unobtrusive. You can easily take it with you and it gives surprisingly surprising results. A wonderful tool to use with fast colour film in bright sunlight! f/123. Focal length 27 mm. Takes 35 mm film. 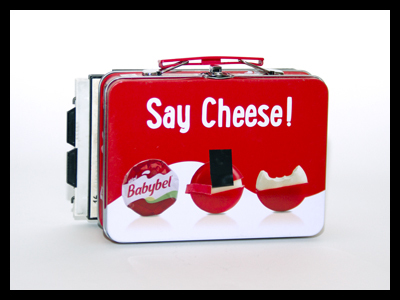 This little metal lunch box turned out to have the perfect size for adding a sheet film holder to its back. And with a perfect front side to be a camera. I made the film holder frame from wood on this one, and that has proved (so far) to be tight enough to hold the filmholder by just pushing it in place. No springs or rubber bands needed! The only thing that bothers me about this one is the fact that the manufacturer could think of making a box with a landscape oriented print when the box is so obviously begging to become a portrait-oriented camera. f/194. Focal length 64 mm. Takes 4×5" sheet film in holder.